Check out my Craftsy video. Here’s the link to Prong Settings from Start to Finish! 0.1 Burs and types of stones to use for gypsy and flush setting stones. 0.2 How to determine drill bit size when setting flush set stones. 0.3 Bright Cutting and thinning a tube’s walls for tube setting a faceted gemstone. 0.4 How to cut an opening for a tube setting in a ring. 0.6 Setting square ended stones, protecting a stone during setting, fixing a scratched stone. 0.8 Is there a way to set cabs flush or almost flush in a copper cuff? 0.9 How can I set a shell in a bezel using a tube rivet? 0.18 Question: How to attach a cabochon setting to metal, bone or horn. 0.19 Question: How do you avoid scratching a stone when using a file to file prongs? 0.20 How to solder multiple settings on one ring shank? 0.21 How to make a ring with multiple settings: how to layout for multiple stones and how to set. 0.21.1 Next up: How to mark a ring shank for setting placement. 0.22 My stone isn’t round, how do I make an oval basket setting? 0.23 What size gauge wire should I use to make delicate prongs? 0.24 How to Solder a Bezel to a Ring Shank. 0.25 How to solder a setting to a ring shank. Burs and types of stones to use for gypsy and flush setting stones. I bought two round Zirconia 5.5mm to practice with, and I am looking to buy the necessary tools to perform gypsy settings. I ordered the pendant drill, but can’t find 5.3mm round burr or 5.4mm setting burr.. am I doing right looking for these two sizes for my 5.5mm stones? Contenti, Otto Frei, and others carry the correct size of stone setting bur, round and hart burs. If you are setting as I demonstrated in the video, where the stone is angled and then tapped in, then yes, you want a slightly smaller bur. I’d try both the 5.3 and 5.4 with your cz’s to see which works best for you. On Gypsy (not the same thing as flush setting) setting: Often, the seats for gypsy settings are created in wax, and the stone fit re-checked and adjusted, after casting. The second cutting is necessary because of the shrinkage that occurs during the casting process. Using a cast ring or other piece of heavy jewelry ensures that there is sufficient metal to contain the stone (it is set deeply within the metal) without the culet poking out the bottom and to ensure that there is enough metal to thin around the stone. But, you can also, either buy really thick stock or sweat solder the appropriate amount of metal onto your piece to ensure ample thickness. Stone choice will be important with flush settings (aka false gypsy, burnished, flush-mount, snap or rubbed settings). I don’t recommend emeralds as they can be very fragile. Spinels, rubies, sapphires, and diamonds work well, as well as man-made stones. You can set other stones like citrine, peridot, garnet, etc., but be aware that they may be damaged due to the pressure applied when tapping it in place. See my video: Flush Setting Faceted Stones for instructions on flush setting. How to determine drill bit size when setting flush set stones. In your video: Flush Setting Faceted Stones, you talked about the measuring of the stone and then taking 1/3 of it to, I think, arrive at the size of the burr to use? Was that it? That’s an old video – 2014 and pre-cataract surgery! I was also, in my original studio. Forgot that my sister popped in (in the hat!) too. It was a walk down memory lane. Weewee LouLoo eating Wonder Woman was funny! Didn’t remember that either! On deciding which bur to use, I always go with a setting bur slightly smaller than the diameter of the stone. So for a 2.0mm, you would use a 1.9mm bur – a 1.8 would work too. But, before using the setting bur, I use a small ball bur to remove some of the material – a 1.8 ball bur works for this part. I re-watched the video and I said, that to determine what size drill bit to use, to drill your starter hole with, you measure the diameter of your stone then divide that number by three. The drill bit size will be then be 1/3rd of the diameter of the stone. Hope this helps! Bright Cutting and thinning a tube’s walls for tube setting a faceted gemstone. I appreciate such a thorough answer [see this post, on this page for the original question]! I do have the setting punches, but still have been having the problem. I’ve thought I was thinning the wall of the tube enough with a ball bur, but don’t have any setting burs…I have a couple of gravers (am planning to use your YouTube videos to try chasing one of these days), but don’t understand how to do what you’re suggesting using a graver on the tube…I’ve read that other places on the web but no one is demonstrating it??? I’ll sure give the idea of using a file on the inside of the tube a try. Re polishing, I LOVE the polishing pins from Rio for getting into tight spaces with various grits…they work wonderfully. Thanks again for your help, and if you have any videos (or links) about using gravers on bezels, that would be of benefit. Hi again! The gravers are used to “Bright Cut”. That video of mine, that I referenced in my prior message, has a section where I use the gravers to bright cut the interior of the already set bezel (towards the end). Here are a few other videos on using the graver for bright cutting: one from Ganoksin. In this video he is using something like the GraverMax – which is just a mechanical version of a hand engraver. Here’s another video showing another technique that employs gravers. I also have some pictures of using a graver, on my website: Setting a Pear-Shaped Stone. Understand that chasing is NOT done with gravers. It employs liners to chase and repousse tools to push the metal out. Have you seen my video on this subject? Note the bevel, that I filed, on my setting (on the Setting a Pear-Shaped Stone page, that I directed you to). In my last message, I noted that you should use the file to thin the OUTER walls of the bezel, not the internal walls. It is very difficult to thin the interior walls with files and not destroy the seat for the stone. So, use a larger setting bur (or a larger ball bur – it doesn’t matter which) to thin the interior walls and/or a file to thin the outer walls. Just be careful to not make the walls too thin. I would start by filing the OUTER walls, annealing, checking the fit and if it is good, then using your Stone-Setting system punch. If the metal still isn’t thin enough, you need to stop and consider whether to file, on the outer walls some more. Filing is a less aggressive way to thin the walls of the setting. You also have more control with a file than you would with the more aggressive ball bur. A very important fact to consider, before moving on is: you need to determine if the ball bur will make the seat, for the stone, too wide and cause the stone to wobble. My guess would be: Yes, it will make the seat too large. So, I’d use the ball bur as a last resort. The bezel should offer some resistance when setting because you are moving metal. It shouldn’t be super, super easy because that usually means that your metal has been reduced to tinfoil! Tinfoil will not hold a stone in place safely or for an extended period of time. If you use the Stone-setting system, with a mallet, the thinned walls should be easy to set – especially if the piece is annealed beforehand. ALSO: you may need to anneal the setting before trying to set again as it is probably very work hardened by now. Just anneal the entire piece. Every time that you hammer on metal, you work harden it. Annealing rearranges the internal atomic structure, creating air spaces, around the atoms, so that they have more room to move – therefore, the metal becomes more malleable. How to cut an opening for a tube setting in a ring. Do you have any tips for placing a tube setting within a ring shank Nancy? I can never seem to cut the angle correctly on the ring and end up with gaps. You can start by drilling a hole, then moving the drill bits up in size. If you have a drill press or a drill press for a flex shaft or Dremel, this would be easier. If you don’t own a drill press, try to hold your arm very still and perpendicular to your work. If you can, lean on something that will hold your hand steady. Rest the side of your hand on your bench – if possible. Two possible hand positions for drilling. Note that the base of my hand is resting on either the vise or the desk. This gives you added stability. The vise pictured is made by GRS: The Multi-Purpose Vise. You can also purchase the 30 piece attachment set. The handpiece is Foredom’s Quick Change Handpiece. Hold the ring in a vise when drilling. Line the vise’s jaws by gluing magnetic strips to stiff leather. (see my video: The Weird Movie at about 20:24 for instructions). This protects your work. Links to materials used are in the video description area. You can open up the hole more with a round file. They make chainsaw files that are parallel and in varying thicknesses. These are great for creating nice, even openings. Otto Frei sells tiny round, escapement parallel files that you might find useful too. Go slowly and check the fit often. You want the fit really snug – maybe even have to tap it in. This holds your tubing immobile during the soldering process too. You can also open up the hole with square, cross-cut burs or a similar type of bur. See my Flex Shaft page for more information. I’m having a very hard time with tube settings. Any good links for help? My problem is with straight tube settings, not using diamonds, therefore can’t put the tube in the flex shaft to set the stone quickly. I’m having a problem getting the tube pushed over enough stone sufficiently to hold it thoroughly. I’ve read about using a graver, but don’t understand what to do with one or how to use it to help with tube settings??? Have you thinned the tubing walls with a small, flat file (a Barrette, escapement file is what I use)? I file an outer bevel on the tubing prior to setting. This thins the material, making it easier to push over the stone. Sometimes, you can just use a burnisher to rub the bezel over the stone. (Image is of barrette files). Rio Grande, Otto Frei, and Amazon all sell barrette files (among many other companies). It makes life easier to have a rough cut and a fine cut – cuts down on the sanding! I like small files too so, if I was purchasing two different cuts of barrette files, say from Otto Frei, I’d buy either 40-2 & 40-6 or 40-4 & 40-8. They come in two lengths, ergo the #40. The other length is 55. There are also parallel barrette escapement files. The smaller the number the rougher the cut. So, a #2 cut is rougher than a #8. Got it? Awesome! The two files that I use most are my 1/2 round and my barrette. Just my preference. There are also these great punches: Stone-Setting System, that makes tube setting really easy. Rio Grande carries them. First, watch my video: How to Use Snap-Set Settings (I, briefly, use the Stone-Setting System in it!). How to use a stone setting punch: (This is all done AFTER the seat is cut, the tubing height is adjusted and pre-finishing is completed.) For a ring, place the ring, faceup on a ring mandrel (you could also use a vise or thermoplastics to hold the ring). Find a punch that fits over the tubing. Center the punch over the setting and tap with a hammer (sort of heavily) a few times. Because the punch is conical, it should push the walls down, over the stone. If setting on something other than a ring, use a vise or thermoplastics to hold your work. Make sure that the piece is supported so that the hammer blows don’t dent the metal. With the punches, you can also set by hand. Place the punch over the setting and with your hand, push down and turn ( 360°) the punch. This can be easily done with thinned or thin tubing. But, is tough with thicker material. If you don’t want to buy the punches and if your bezel wall is particularly thick and the stone is large enough, you can employ a hammer handpiece or use a setting punch (or a bezel pusher) in conjunction with a hammer. Secure your work. Tap the rim of the tubing around the stone (with the hammer and the punch), by punching at an angle and rolling the bezel rocker or pusher, up towards the stone, in an arcing pattern. This is done by first pushing in the north wall, then the south, east and then west. The next course pushes in the areas between – NE, SW, NW, SE, etc. until all the walls are pushed in and down. The punch is held at about a 45° angle and rolled up over the stone. Tap often, rather than tapping hard. Think of yourself as a little hammering machine! Ensure that your work is fully supported either in a vise, on a mandrel or stuck in some thermoplastic. Protect your work with leather or plastic jaws in your vise. Clean up the interior edges with either a graver if desired (see my page: Stonesetting: Setting a Pear-Shaped Stone for information on using a graver). A graver is used to clean up the inner edge or to cut a seat – not for setting. John Cogswell’s book: Creative Stonesetting has info on using the graver on the interior edge of a setting called: Bright Cutting. See pages 58, 59 and 60, of the book. While you’re looking for good stone setting books, check out my Link: Books: Stone setting too! If you have a burnisher that can reach the interior bezel wall, that can be used to polish the interior edge of the setting too. If there is a lot of clean up, and your filing skills are pretty good, use an escapement file (2 barrette files: one a #2 or #3 (rough) and a fine file (5-8) to file away dents, scratches and imperfections on the outer and inner edges of the setting. Take care to not over-thin the setting. You can also use, in conjunction with the files or alone, silicone polishing wheels: pins or knife edge, to further refine the surface. You can also just burnish the bezel if there aren’t a lot of deep scratches. See my Youtube video: How to Make a Bezel and Set a Cabochon at 31:30 – this is where I set the cabochon. It’s basically the same process. How to clean up a bezel that is damaged? See this question under soldering for the answer. My answer also discusses how to move a soldered element. Setting square ended stones, protecting a stone during setting, fixing a scratched stone. Please see my page: Setting a Pear Shaped Stone and Settings for Irregularly Shaped Stones and Objects. Setting stones with pointy ends, like your pear-shaped and square stones, is a bit tricky as the tips are very fragile. Do you have John Cogswell’s book: Creative Stonesetting? If not, I highly recommend purchasing it. On pages 73 and 74 Mr. Cogswell discusses your question, as do other books. I have links, to several here, under Stone Setting Books. Pear and Marquise stones are more difficult to set because the extreme angles involved. Please see my stone setting page for directions on how to create this setting. (Coming very soon). I have set many bezels as you describe and it takes some practice. Wear the most magnification that you have available. I often wish that I had a microscope for setting, ah, so many tools, so little room or money! I recommend creating a practice bezel from copper and then try the technique. It is much less frustrating to mess up a practice piece than your final piece (plus you get all that bezel-making experience). Much of the jewelry in my “try it again later” box is in there because of stone setting problems. Fortunately, it only happens infrequently now. Part of the reason for that is the following technique. Rub a piece of blue painter’s tape or masking tape over the stone so that, if you slip with the burnisher or sanding discs/sandpaper/files, you don’t scratch the stone. After applying the tape and smoothing it down, run your thumbnail in the crease between the stone and the bezel wall. Using a very sharp razor knife or scalpel, cut the tape away. Cut with the blade tip angled towards the bezel wall so that you don’t scratch the stone with the scalpel. Obviously, the smaller the stone, the more difficult the above process is. I don’t bother taping stones less than 4mm. If you are prong setting, the tape can get stuck under the prongs. Here’s a little video, that I made, on how to apply the tape used to protect your stone. For minor scratches: use a Diamond Abrasive – starting with the # 45-micron polish, then #14 and finish with the #1/2 micron on a felt buff (if you purchase this set and have a quick change handpiece, you can purchase several 3/32″ mandrels to use instead of the 1/8″ supplied.) Make sure that you get a buff that will fit in your flex shaft. They make large buffs for buffing wheels – you don’t want those! These Miniature Felt Buffs have a 3/32″ shank that will fit in a flex shaft and in a quick-change handpiece. Note: there are other types and grits of diamond paste. I just chose Rio’s because it came as a kit. If the scratch is deep, you can try silicone polishers. Use knife edge for larger areas and points for smaller. Start with black (medium), then blue (fine) and finally pink (extra fine) (the white is coarse – you probably won’t need that – I hope). End with the diamond polish (probably just the final #1/2 micron). Experiment. Clean up the stone and/or setting with a soft toothbrush, warm water, and dish detergent. With faceted stones, be very careful to not sand off the facets. With cabs, try to avoid digging a hole or sanding flat spots into the stone. This is a very subtle, delicate operation. Practice with inexpensive stones, CZ’s or glass stones first. ***If the stone belongs to someone else, is very expensive, old or not something you feel comfortable fixing, bring it to a jeweler/gemologist/faceter/lapidary, in your area. I would be very nervous to solder anything with a pearl in/on it! Is there any way that you can remove the pearl? Heat is not very kind to organic matter. But, saying that, there are a couple of things to try but, I’d try them with a cheap pearl and the same type of metal you are using (as the conductivity, inherent in the metal, should be the same for testing). Some people find a way to submerge the heat sensitive material in water. Is there any way you can prop it so that it is completely submerged? The water will keep the pearl from getting hot. There are special soldering compounds that are designed to protect a stone from heat, that you can try too. You can even use a potato or Paperclay! Check out this article, Protecting Gems While Soldering at Ganoksin, written by Charles Lewton-Brain, for more information. Is there a way to set cabs flush or almost flush in a copper cuff? Yes, there is a way to flush set cabochons in copper or almost any metal. A lot depends on how big the stones are and the thickness of the metal. Charles Lewton-Brain has a piece on how to create a gypsy setting. He uses a faceted stone but, you can do this technique with a cabochon. Creative Stonesetting by John Cogswell has a chapter (6) on Gypsy and Flush Mount Settings. Mr. Cogswell also discusses another technique called the Roman Setting. All require thick metal. There may be a way to make this work for you. There is also the invisible setting. Although, you’d probably need a square or rectangular cab but, maybe not. It’s easier to do these setting in wax, and then they are cast. But, they can also be done with metal. You could also backset the stones. Tim McCreight has a little information on this technique in his book: The Complete MetalSmith on page 128. Think I need to do a video on this technique! A little more info on the gypsy setting and more here. Here’s info on setting, in general, from Jewelry Making Daily with a bit on the Gypsy setting. Here are my ideas – such as they are: The problem with setting into the rivet, WITHOUT, soldering a tube in there lies in the fact that there isn’t any metal left to pull over the stone to hold it in place – it’s all schmeared down from the riveting process. But, in fact, there is still some metal that you can use!!!! But, you have to wait and listen to my other ideas first! Option one (cheating – but, what the heck): You could epoxy the stone in. Option two: make a rivet (nail) from a disc of metal from 10 – 14 gauge or so. You would also need a wire that just fits into the tubing for this – like telescoping tubing for a hinge. In the end, it would look like a nail. So, you make the nail, push the wire into the tubing, rivet the wire on the back side only (over the other rivet a bit) – taking care to not mar the disc on the top. THEN, you flush set the stone into the top of the disc. I’ve never done this but, it could be cool. Practice First! (see drawing) You could probably cut a seat in the rivet tubing for the disc to slide down into – otherwise, it will poke out a hair or three. Option three: Cut a seat in your thick tubing – after riveting. Drop the stone in and then, with a graver, do what’s called raising stitches. (In the book Gemstone Settings by Anastasia Young, on pages 154-155, there are examples of other types of backsetting). You can also check out Tim McCreight’s book, The Complete Metalsmith, (link below). Basically, using a graver, you curl a piece of metal, down over the stone. I’d use a tiny burnisher (make one from a broken drill bit, smoothed and rounded?) to press them down further. You can also use a beading tool to round them up. I have backset rings by raising stitches to hold the stone in place. Stitches aren’t the strongest things in the world but, your stone is small and will be set pretty low. Practice with the graver first, if you haven’t already got the hang of it. Tim McCreight shows the technique in The Complete Metalsmith on page 128 but, it is slightly different in that he is holding a collar of metal up against the stone (from the back) and you don’t a: have a collar and b. aren’t able to get behind the stone. I’m thinking that the seat will act as a collar. One last idea: Is what you are riveting able to survive the torch? If so, maybe you could make tiny prongs. Drill holes in the perimeter of the smashed down rivet, close to where the stone will be. Set the prongs into the holes and solder. Set. Although, I once tried to make a tiny nose ring for myself with prongs and went insane (permanently). I’ve searched the internet and can’t find anything that relates to this subject so, these ideas are all that I can offer. Whether they will work or not, I don’t know. CZ’s are as abundant as sand at the beach! Here’s some at Amazon. Here’s a link to 3 mm’s, specifically.There are a ton of other suppliers. I know eBay sells them and Etsy too. Just Google: (size wanted) “3mm round CZ loose”. With the setting, be prepared to make a few mistakes. When I started this technique, I drilled a bunch of holes, cut as many seats and started setting away – maybe 10 – 15 settings. I tried teeny stones (1mm and 1.5mm), small (2mm-3mm) medium (3.5mm – 4.5mm) and large (everything else). They all set differently. The smaller stones are easiest to set – believe it or not! Wear eye magnification when doing this technique – it will help a lot. I’d, also, abandon all need for perfection and just go for it. When snapping them into place, use a soft pusher like a pointed, copper rod or a urethane rod and try to tap only once or twice on that opposite edge. You’ll figure out how hard, soon enough. People (I include myself in this category), usually set them too shallowly, too deeply, crookedly/unevenly or they crack the stones. You want the table, of the stone, flush with the metal. You can always solder two pieces of metal together for more depth. Larger stones can sit a little higher than small – their tables can be a bit above the plane. Don’t have the culet sticking out of the bottom. I always recommend practice – until you are very comfortable with the technique – before setting on a finished piece. I am just finishing a piece that has several set stones. In one of the settings the stone was a bit low in the bezel and I didn’t notice it until I was almost finished (yes, I know, what was I thinking//) Anyway, is there a successful way to get the bezel away from the stone so that I can remove the stone, insert some material into the bottom of the bezel to raise the stone and then reset it using the same bezel? It is already set on a backplate and soldered to the piece. How to remove the stone from the bezel that is already pushed and formed over the stone. Any ideas? Another method that could have been used to create this ring, is fabrication. I’ve included this link from Alan Revere at Ganoksin from his book: Professional Goldsmithing. I can’t believe I actually found the pattern (and the instructions – thank you Alan! ), as I first made this ring when I was a new jeweler – almost 20 years ago! It took a while to remember where I got the pattern from. The ring didn’t turn out right but, I still have it and fondly recall struggling through its construction. There are several good books on stone setting. I have a few listed on my website under Books: Links. There are also books, that I own and use, on jewelry making. “Nobody tells this to people who are beginners. I wish someone had told me: All of us, who do creative work, get into it because we have good taste. BUT THERE IS A GAP. For the first couple of years you make stuff. It’s just not that good. It’s trying to be good. It has potential, but it’s not. But, your taste, the thing that got you into the game, is still killer. Your taste is why your work disappoints you! Today I am grappling with square bezels, making one, and dealing with those enigmatic corners when setting the cabochon. Any tips? I don’t have any info on setting square stones on my website or in my videos – yet (except for this page, of course!) – but, I can direct you to three, particularly good setting books. Creative Stonesetting, which is my favorite and my second favorites are Gemstone Settings and Design and Make: Mounting and Setting Stones. I also found this article, at Ganoksin, that has some information on the square stone setting. This article from Alan Revere at JCK, is more on the actual setting part – not on the creation of the square setting. Square Bezel Forming Punch (cheapest I found was at Rio Grande). Some tools that can help in the creation of the setting are (in the UK): Plate and Punch set from Cookson Gold, Wubbers square pliers, and square bezel mandrels or triblets, as they are called in the UK. The forming punch creates square bezels that are tapered. You must use a heavy gauge metal (18g or 20g – .8mm to 1mm) or the sides will split. Anneal often – I mean – anneal a lot, a heck of a lot, go ahead anneal it again! Make a washer first with a small center hole. Ensure that your disc is large enough to create sufficient wall height. Here’s a link to Rio’s, rather limited, directions for the tool. See the information in Further Research, below for more links. As usual, I recommend practicing with brass, bronze or even copper. Of course, all metals will act differently. Ah, the joy of experimenting. Please see Gemstone Settings by Anastasia Young pgs. 100 – 101 for information on square settings. Also, take a look at my Books page on Stonesetting, for other good setting books. I also have a little information on stone setting on my page: Stone Setting. Don’t know if you’ve been there or not. I plan on adding a lot more information on that page but, alas, lack of time and energy are fighting me tooth and nail. Square bezels are frustrating. Your measurements need to be very, very, very precise. Also, you might want to make a few practice ones in copper. Don’t forget to account for the thickness of the metal and the metal taken up by the bend/groove. Use digital calipers – if you’ve got them and dividers to mark the metal – much more accurate than a sharpie line. I always use a very thin cut off disc to cut grooves for my bends. In combination with the cut off disc, I use a steel ruler as a guide to keep the cut clean and even; holding the wheel against the ruler. Using a ruler and cut off wheel to score metal. After a sufficient groove (deep enough to hold the square file without it wanting to slip out of the track) is cut (check often), I go in with my square needle file, using one of its 90° edges, which removes metal from around the cut (creating a 90° groove) so, that there is sufficient space for the (90°) bend. Using a square file to make a 90° groove in metal. You’ll know you’ve cut enough when you can see a faint outline, of the groove, on the opposite side. Check after a few strokes, check often! I’ve cut through the metal far too many times but, I’ve found, that by carefully bending and limiting the amount of handling, I can solder it closed before the pieces separate. Sometimes not. Over filed (on top) and (almost) right on the bottom. Looking at the backside of the metal. Bend using wide, square pliers or the 90° bend of a square steel block – anything that has a perfectly square edge. Whatever you use, make sure that it has a PERFECT 90° angle. That usually means a manufactured edge. Solder and clean up. A small combination square helps to make sure that your bends are at 90° angles – or use that bench block to adjust for square. Here’s a link on how to make a scoring tool. And another scoring tool link. What Gemstones Should I Use When Starting Out in Stone setting? An inspired question! There are many gemstones that will work. When just learning stone setting, I recommend using stones that have a Mohs hardness of over 6. Preferably, you’ll want a stone even harder – something in the 6.5 and up – range. This is so that you don’t accidentally scratch your stone while filing, finishing and shaping your prongs – although, care should always be taken. The Mohs scale was created by Friedrich Mohs back in the 1800’s. The scale was devised to measures a mineral’s hardness and starts at #1 (the softest) and goes to #10 (the hardest). For example, talc is a 1 on the Mohs scale and Diamond is a 10 (in more ways than one – in MHO!). Hardness is a measurement of the minerals ability to resist scratching. So, to protect your investment try a harder stone like one of the many, listed below. You can also put a small piece of blue painter’s tape over the stone while working near it to protect against accidental slipping or having your pumice wheel mar it. Another method is to cover the stone with your thumb. Taking your time and moving very slowly helps too. If all avoidance techniques fail and you scratch or mar your stone, you can re-shine the stone. Employ a felt wheel and your flex shaft for this process. Apply ascending grits of diamond paste and a small drop of water (the higher the number – the finer the grit) to the felt wheel and polish until the scratch is gone and the stone is shiny. If the scratch is really deep, try starting with sandpaper and then working your way up the grits of paper and diamond paste until you reach the perfect shine again. Some hard stones to try working with, that are in the Mohs range of 6.5 and above, are: Alexandrite, Amethyst, Aquamarine, Carnelian, Citrine, Chrysoberyl, Garnet, Iolite, Peridot, Quartz (smoky, lemon, strawberry, rutile, etc. ), Ruby, Sapphire, Sunstone, Topaz, Tourmaline and Zircon, to name a few. Don’t forget Cubic Zirconiums (CZs). CZs are great for beginning stone setters. They are hard (8-8.5), can withstand high heat, are inexpensive AND beautiful. You can also try lab-grown stones – just make sure that they are hard enough. It’s hard to tell the difference between a diamond and a CZ with just a glance! Sparkle, sparkle. Usually, the less expensive, natural stones have less intense color, might be poorly cut, are not truly clear, have internal inclusions and/or external blemishes (the three C’s: Cut, Clarity and Color – the main factors [but, not the only factors!] in determining a stone’s value). But, if the stone is beautiful to you, who cares! As you learn and have more control, then invest in those pricey sparklers! Some stones to be careful using are Emeralds (they are hard at 7.5 to 8) but, they almost always have fractures and inclusions that can make them brittle. Other soft stones and organics that are either too soft or have issues that can affect their stability: Apatite, Azurite, Fluorite, Labradorite, Lapis, Larimar, Lazuli, Opals, Pearls, Shell, Turquoise, and others. Gem Guide has a lot of great information on how gemstones are valued. The IGS (International Gem Society) has tons of information on Gemstone Wearability and Hardness. Gemselect has a table of many stones and their hardness. Should I flatten part of my ring before soldering the setting on as you showed us with the first setting? Thanks for the fabu question. Well, it depends on your ring shank and the size and type of your setting. If you are working with a small stone like a 3mm AND your ring shank is made from flat shank material, there’s probably no need to do so. You can tell easily, whether or not to file a flat spot: place your setting on your ring shank. If it doesn’t sit flat, hangs off the sides or looks like it’s about to topple over – you need to file a flat spot or shape the setting to match the curve of the shank. Use files to file a curve in the base of the setting to match that of the ring shank. Generally, you don’t file a curve with a flat-backed bezel setting. Tube settings, crown settings, prongs settings, etc. work better. Although, I’ve made bezels where the stone was set 1/2 way down, in the bezel. That allowed enough material to make a curved base. In this image, the back of the bezel was shaped to match the curve of the cuff. I did this because the stone was very large and looked kinda stupid floating on the curve of the cuff. Having a hanging setting is sometimes desirable. As long as it looks intentional – as in part of your design – there’s no problem with doing that. I made this tiny, thin ring where the setting hung over the sides. It looked intentional. Always ask yourself: does the setting look like it belongs there or does it look like it’s a mistake. Is the setting securely mounted on the shank? How strong is the join? If very little of the setting is sitting on the ring shank, you won’t have a strong join. Rings (and bracelets), especially, get a lot of abuse and wear and tear so, the components of the ring (or bracelet) should be very secure. I’m in need of some help. Every time I go to make a bezel it never sits flat on the backplate. I try to file it down but it never sits flat. Any advice? You can try leveling it with pliers or place a piece of wood over the bezel and push down (hammering might bend thin strip) but, that usually doesn’t work that well. But, if annealed, it does work somewhat – maybe enough to get it to lay flat-ish! I also, after placing the stone in the bezel and elevating it off the floor of the setting, rub the bezel over sandpaper. If the stone isn’t in the bezel when you do this, it will become distorted. If you anneal before sanding, you have a better chance of flattening it just by pushing on it while sanding but, it probably won’t be perfect. After sanding: I flux the backplate and the bezel wire, place the wire in position and then heat the flux WHILE holding down the bezel wire with my soldering pick. I move the flame and the pick and work around the bezel until the flux has glassed and is acting as glue. I check for gaps, apply a little more flux (if necessary) – just to that area – and hold down while applying heat. Then I apply solder and solder. I use the soldering pick during soldering also, to GENTLY hold the bezel down. Don’t push too hard (on the bezel wire) while the heat is on it, as you may crush the walls. You can also use binding wire to hold the two pieces together. Many have great results with that although, I don’t use it very often. A stiffer wire may help too. What gauge are you using? A lot of the pre-made bezel wire is only 28 or 30 gauge and that is almost impossible to get flat as it is so flexible and never holds its position. Try making your own bezel wire from 26 or 24 gauge sheet. The nice thing about making your own is that you can choose the gauge AND the height that you need. You can buy 24 gauge, pre-made bezel strip but, it only comes in one height for fine silver – 3/16″. Of course, you can make the bezel wall shorter by filing or cutting with shears. It is harder to hammer over the edge of the bezel walls when you move into the thicker gauges – so, there are some compromises. But, you can file a bevel on the outer edge of thicker bezel wire. This thins the bezel wall, making it easier to push over. It is also a nice design feature. Ensure that your filing is even and smooth. I really want to learn how to make this setting. But, I have no idea where to start. I have watched bezel setting tutorials but none of these show how to achieve this tapered bezel following the shape of the stone?! I have searched the Internet high and low and I can’t even find what the setting is called, I am assuming it is just a bezel setting but I really love the shape of it yet I have no idea how you would get the bezel in that shape? Help me, Nancy! Tubing and a Bezel Mandrel: You can buy or create a tube and shape it on an oval bezel mandrel. Then you solder either a piece of wire or a strip of sheet metal into the bezel (a bearing). 24 gauge is sufficient for the wire and the sheet metal It needs to be set deep enough that you have enough material left to push over the stone. It’s easier to make the bezel a little bigger and file it down, if necessary. The wire can be round or square. You could try triangular wire – it might have enough angle that the stone rests on it evenly. Please see my web page: Setting a Pear-Shaped Stone for information on making bearings and setting a stepped bezel. The only differences between setting a pear shape, square or rectangular setting and an oval is that you don’t have to account for angles or setting the corners. Create a Cone: You can do this by either reading (see John Cogswell’s book, Creative Stonesetting, pgs. 88 – 89) or try watching a video like my, How to Make a Cone. Solder the seam. Cut off the tip and shape it on an oval bezel mandrel. Follow the steps on my web page for creating the bearing and setting the stone. Using a Bezel Forming Punch: Bezel Forming Punches create tapered shapes. I recommend using thick tubing (Rio Grande carries some) for use with this tool. Soldered seams on tubing or cones, tend to split because of the stretching that is involved in shaping the bezel but, Bezel Forming Punches and Blocks are quicker and easier to use than making a cone or hammering on a bezel. They are also costlier at around 90.00 – 150.00 depending on the shape. Solder in the bearing for the stone as described on my web page. In this instance, you’d want an oval punch. Don’t forget, in all of these processes, to anneal often! Otherwise, you will have splits and tears in your metal. If soldering onto a ring shank either: 1. file a flat spot on the ring shank or 2. shape the bottom of the setting to match the curve of the ring shank. Is it possible to get mildew underneath a bezel set stone? I’ve had a necklace returned to me with what appears to be mildew growing underneath a blue chalcedony cabochon. I took the stone out of its bezel, and there is absolutely no discoloration on the metal. It is on the stone and does not even scrape off with an Exacto knife. It is as if the stone itself is changing color. I’d love to see a photo. There is always a chance that something can get under a stone but, I bet mildew isn’t growing there. Did you use a patina? That can sometimes creep behind a stone – especially if you didn’t neutralize and clean the piece well after applying it. If you didn’t neutralize the patina well, it could continue to work. Also, acid from pickling can still be present. I’ve had rings form an orange corona around the solder joins – because I didn’t neutralize and clean well enough. I’d boil the ring in baking soda and water – especially if it has any hollow parts. I have seen some disgusting crap in peoples rings but never mildew. If there is mildew beneath the ring, that isn’t your fault. You didn’t send it out that way – right? But, I doubt it is. I’ve never seen that happen. Unless your customer is very slovenly and regularly shoves her hands into weird stuff. Another thing that could have happened was that the metal (I’m assuming silver) tarnished – naturally. Maybe your bezel setting wasn’t as tight as it could be and air (and/or water) got under it. If the fit and the bezel are tight enough, it should discourage tarnish. Also, water, soap and other things we come into contact with, have chemicals and minerals in them that can alter the color of silver, copper, brass, and bronze. If she (she is a woman, right?) washes dishes with her FINE JEWELRY ON, scrubs toilets, gardens or washes clothes (all no-no’s in my book) or if she went in a hot tub or a swimming pool, it’s very likely that SHE created the discoloration. Ever had a ring gone black in a hot tub? I have. Bleach, spa chemicals, chlorine, etc. can discolor silver. I don’t think it’s mildew. I think your customer got into something that patina-ed the metal. I would fix it and charge her for the repair. Then, I’d remind her that your jewelry is art and doesn’t belong in a hot tub, a toilet, the garden or the kitchen sink. Well, maybe just mention that exposure to water and chemicals can often discolor silver! The answer to Updated Question: At least you don’t have to feel bad – it wasn’t anything that you did! Do you have a gem and mineral society near you? Maybe the stone was treated with something and it’s breaking down. They could tell you what’s happening – maybe. A lot of stones have fillers and sometimes, the sellers use unscrupulous methods to make a stone look good. Maybe time to buy a new stone for the necklace! Can you return the stone? Question: How to attach a cabochon setting to metal, bone or horn. You can attach bezels to metal by sweat soldering them. I have a video on this technique: Sweat soldering. As to attaching to bone or horn, I recommend that they are glued in place with epoxy or you can rivet bezels to the bone. Two rivets would be the minimum recommended so that the setting doesn’t spin. See my videos on Riveting. You could also try small screws or nuts and bolts. I have never set a stone in horn or bone so, I am not an expert. Another option is to use tabs. See my video: Creating a Frame Setting, Parts one and two. This setting uses tabs to hold in the piece being set. Question: How do you avoid scratching a stone when using a file to file prongs? “What is the minimum MOHS hardness that a stone should have if you are going to file next to the stone without damaging it? I’d stick with stones 6 and up on the MOHS scale, when first learning. But, with practice, you won’t be limited to harder stones. I don’t touch the stone with my files (these days!). One of the tricks I learned was to go nice and slow. Breathe in, file, breathe out, file. It’s jewelry yoga! I use my (non-dominant) thumbnail as a guard. It takes a little practice but, it’s a very effective tool. You can also use blue, painters tape and it’s not just for “softer stones”. First, push down the prongs, into their final positions – then apply the tape. Place the tape over the stone, smoosh it into all the areas surrounding the prongs. You can make a pushing tool, to push the tape into recesses, from a popsicle stick. File a smooth wedge shape, with a fine point. You can make the pusher smaller, like in my image, by sawing out part of the popsicle. Or, make a more permanent tool from a toothbrush, shaped in the same fashion as the popsicle stick. After you’ve made your tool, G E N T L Y cut, with a sharp blade like an X-acto knife or scalpel, a slot on the top of each piece of tape, which is over the prong. There may be a small, thin mark left on the prong afterward. But, that should be easily removed with filing and/or sanding. If you put tape on the stone, before pushing down the prongs, you will have a heck of a time getting the tape out from under them. So, remove the tape before pushing over prongs or bezel walls. NOTE: blue tape is really difficult to use with smaller settings! But, it’s great for cabochons and larger stones like a 6mm and up stone. Use an escapement barrette file when filing. The barrette file only has one cutting side so, there are fewer surfaces to accidentally scratch something with- like your stone or your setting. Your barrette file will probably need some finishing before use. Smooth and polish the two sharp, side edges before filing your prongs. Having shiny, smooth edges will reduce the likelihood of scratching your stone if the file happens to graze its surface. That shiny edge can also be used as a micro burnisher. Escapement files are smaller needle files. I usually use two different cuts: a rough cut, like a #2 and a finer cut like a #6. Although, you can start with #0 and go through #10! But, I don’t think it’s necessary to use that many files. Think about the cost of having all those files! Good files can run 15.00 – 25.00 or more – EACH. Having a full set, or just one file type, could cost you some serious lunch money. Swiss and/or German cuts of files run, from the roughest, #0, to a #10 for the finest. Small files make working with even smaller things, much easier. If you use an escapement file for filing small settings, you will no longer be using a sledgehammer to drive in a tack! Good luck! How to solder multiple settings on one ring shank? I love these rings that have several bezel setting on them, but how do you solder them all on the shank? Do you just have to be really good with binding wire and gravity-defying balancing acts? I have heard of stuff like Blue Fuse for sticking things together for granulation – can this or something similar also be used to hold objects in place for soldering? See the following question and answer for a more detailed response. Blue Fuse is used, usually, for granulation. You could try it though, products like this are used for fusing metals. I have not tried holding settings on with granulating solutions. It’s a balancing act with binding wire or you do what I do! I solder them one at a time. Since I hate binding wire, I have come up with contortions employing cross-lock tweezers. I usually put my setting face down, angle the shank and hold it in cross-locks. All to avoid using binding wire. I have lots of props like domed copper discs, broken crockery, nickels, thin slices of metal, etc. that are used to either hold the piece at a certain angle or to hold the cross-locks where I want them. I’ve used up to 4 pairs of tweezers to get something to sit right and then I remove them (carefully) during the soldering process (they are SUCH heatsinks!). I’ve included a mock setup (see image) so you can see how I solder most everything. I also flux first, apply heat and a tiny bit of pressure, with my soldering pick, to the pieces to be soldered. After the flux hardens and becomes glue-like, I then apply solder and solder the elements together. You can start with hard solder and use a medium for the next – if you must, use easy too. But, if you focus the heat right, the other solder joins shouldn’t release. You can also prop up the other settings to help hold them in place – in case they get overheated. Update: 10/04/18 – like everyone, I learn new things every day. Since I wrote this response, I’ve learned the joys of magnesia blocks. These blocks are quite messy and don’t last as long as a hard charcoal block will but, they are great for soldering small (and large) settings. Prongs and even tubes, can be pushed into the block – holding them firmly in place. Once the small parts are embedded, you can use a third hand or a cross-lock to hold the larger piece in place. Solderite board with alignment lines drawn. In the image, the setting is under ring shank. Another option is a soft Solderite board. The joy of this board is that you can not only embed parts but, you can also draw (with a Sharpie) an “X” from one corner to the other – giving you the locations of four prongs. Insert your setting (jump ring, tube, etc.) into the place where the lines cross and then push your prongs into the four lines. Make sure that they are pushed in tightly to the setting. Another problem encountered when setting multiple stones is accessing the prongs/walls for setting and seating the settings on the band. Using Stone-setting Punches makes setting small bezel and settings so easy! Simply push and twist. If you have thick wire or tubing, you can hammer the punch down, over the stone. There are two methods to attach a setting to a band: 1. you can file a flat spot onto the band to attach the setting or 2. you can file the setting back to match the curve of the band. See this question for how I solder a bezel to a ring shank. How to make a ring with multiple settings: how to layout for multiple stones and how to set. I’ve watched most of your videos and purchased your Craftsy class, but my daughter wants a .07 wide gold band ring with about 7 tube-set tiny diamonds that would measure 1.4 mm after being tube set. My question is: I can do one tube set in a ring band, but not sure how to do 7 tube sets in a band, she wants 14k gold, so maybe it would be easier to solder it together. The gold won’t necessarily make it any easier to solder. Gold has a lower thermal conductivity than silver. Silver, whose thermal conductivity is 235 (at 68°F), tends to lose heat a bit more quickly than gold. That means that the heat moves away from the area where you want it rather quickly. When soldering silver, one usually heats the entire piece and then focuses the heat on the area to be soldered. When soldering gold, the heat doesn’t “run away” as fast so, heating in a more localized area is more effective than with silver. Gold has a thermal conductivity of 182 (at 68°F). In comparison, copper has a thermal conductivity of 223 (at 68F). If soldering two different metals, focus more heat on the metal that conducts heat the fastest. I.E. : soldering gold and silver: apply more heat to the silver. For more on metal conductivity, please see this page at Engineering Toolbox. Next up: How to mark a ring shank for setting placement. You can create your scribed lines after the ring shank is soldered or before. Sometimes, it is easier to mark the center of the diameter and the length before bending – sometimes not! Experiment, to find what works best for you. The centers are marked and a grid is setup based on the center line. This is a good method if you are cutting azures and need to find the center of the setting. Before shaping the ring shank, measure the length of your band and find the center. You could put the center anywhere on a round ring but, usually, you want the center to be opposite the soldered seam. That way, if the ring needs to be resized or repaired, another jeweler will know where the seam might lie. 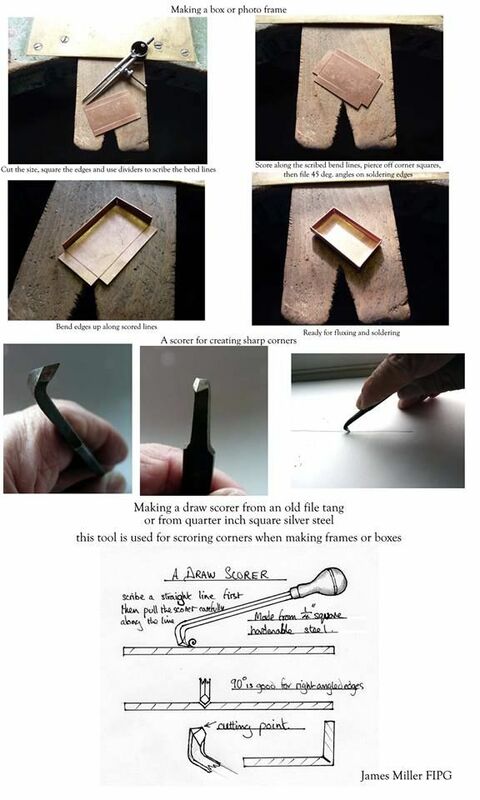 Use a square and a scribe to scratch a line across the center of the band. Ensure that the edge, that goes up against the square, is true and level. The square won’t give you a nice even, square edge if it is held against uneven material! If you are using ring stock, your edges are probably already trued. But, if making your own ring shank stock, you might have some wonky edges. See my video: Flat, Square Edges on Sheet Metal and my webpage: Tools for Squaring Metal. Next, measure the width of the ring shank and mark the center of that (on both ends) – once again using the scribe and the square(or ruler) and scratch a mark, lengthwise, down the center of the shank. Where the two lines cross, is the location of the center of your first tube. Subsequent measurements will expand out from this mark so, take your time and ensure that it is in the right place!!!! Round and solder (or not, if it is an open shank) your ring shank. NOTE: in the image above, I’ve marked out the placement of all the settings for demonstration purposes. If you mark the setting placement before bending the shank, the rounding process may change the location of the settings. It is best to mark individual settings AFTER shaping the ring shank. Now, Measure your setting. You’ll need to know the diameter of the tubing or settings. You can either line up the dividers with the outer edges of the setting, measure with a millimeter ruler or use calipers to measure the setting and then set your dividers to that measurement on a ruler. Be as exact as possible! With tapered settings, measure the diameter of the setting where the stone will sit or at its widest part. It is easier to do the following steps if the ring shank is held in a vise-like a GRS or a ring clamp. See my Tools/DIY page for ideas to make your own, moveable vise and for methods of holding items during setting. Once the dividers are set, place the first point in your central mark and spin it over to the right or left and make the next mark. While still in the center point, swing the dividers in the opposite direction and make a mark on the opposite side. If you have more tubes or settings to place, set the dividers in the center of the next mark, swing them to the next space and scratch another mark. Move around the ring shank like this, until all of your locations are marked. This method uses the same techniques as method one but, instead of marking the centers of the settings, you are marking the outer dimensions of the settings. You can apply a thin layer of wax onto the ring shank and stick the tubes into the wax. See this video: Multiple Side Diamond Setting by Stonesettersrb on YouTube. Azure creation: Use a punch to create a divot in the center of each grid. Drill out a hole through the divot. A simple option for finishing the hole is to use a bud bur or a ball burr to create a more finished looking opening. Tubing prep: Cut the tubing to the correct height. File or sand off any burs. Use a tubing cutter for consistently sized pieces. The Bergeon Tubing Cutter is the best one, IMHO. File the backside of the tubing to match the shape of the ring band. Solder the tubing onto the ring band. Here are some videos that might help. They are short, little videos on laying out your grid. Bench Media. Stone Setting with Brad Simon: Azures – A Jour. Ganoksin. Different Methods of Cutting Azures. Sonia Cheadle. Design & Make: Mounting & Setting Stones. Pgs: 74-75. These pages show the layout for center layout for channel setting but, the principles are the same. My stone isn’t round, how do I make an oval basket setting? I’m taking your prong setting class but haven’t actually started anything I ’m still waiting to get all of my supplies. I still have no idea about my stone and how to set it. My husband brought back a few stones from Thailand they do NOT have a flat bottom they have a flat faceted top and small pointy bottom. I had it reversed when I asked you the question. I’m still wondering how to set it since it’s not round and can’t use a tube setting. I tried making a bezel but don’t know how to secure it. The settings I demonstrate in my Craftsy class: Prong Settings from Start to Finish, are all for faceted stones, meaning the stones have pointed bottoms. The point, usually, points downward when set. So, not being flat is good. What shape is it, if it’s not round? Is it oval? Sometimes, stones are cut poorly and are neither round nor oval – they are the most difficult to set. I either have them re-cut or don’t use them. I have several rubies that are worthless because the cut is so flawed. If it is oval, you can make oval jump rings. You use a tool called a bow-opening plier (Amazon) and (this link from Micro-Tools). First, create a round jump ring, then solder it shut. Use the bow-opening pliers to create the oval shape. The bops (bow-opening pliers from now on – lots to type!) open in the opposite direction of regular pliers. When you squeeze them, they spread the jump ring apart, creating an oval. The amount of force you put on them determines the amount of the oval. You can also use an oval bezel mandrel to shape your jump rings. If you don’t already own one, purchase one that is: 1. steel and 2. has a very slender end. Understand, that ovals are not all the same shape. For example, look at all the differently sized oval wire drawplates on Contenti’s web page. Place the round, soldered jump ring on the mandrel and hammer with a mallet or shiny-faced hammer. Use a mandrel holder. Hammering on wood reduces the force of the hammer and it takes a lot longer. Also, anneal the jump rings if they get hard to move. Then, just follow the directions in my video to make the settings. So, without seeing your stone, I don’t know what else to advise you on. What size gauge wire should I use to make delicate prongs? I like the look of daintier jewelry. What is the thinnest/smallest gauge of wire to use for the prongs or shank for a simple or traditional basket setting? A lot depends on the stone size. If you are using very small stones (3mm and less), you could use 20 gauge wire. I don’t know if 22 gauge would be able to survive on a ring though. Although, I haven’t tried it. I worry that by creating a delicate look (by using very thin wire) the gauge would not offer sufficient strength to hold the stone. It’s a balancing act between the visual and the practical. A lot also depends on how the jewelry will, eventually, be worn. If used for a ring, the setting might easily bend and the stone could be lost – due to the amount of stress placed on a ring. The same would be true of bracelets. Earrings or necklaces wouldn’t require as much to protect the stone as they endure less wear. I would make a few settings, using the same sized stone, with varying gauges and see what works best for you. Wear the piece for a while and see how it does. CZ’s work great for testing as, especially true for small stones, they are inexpensive. Remember: one of our setting goals is to provide a secure setting for the stone. How to Solder a Bezel to a Ring Shank. Can you share how you solder bezels onto flat silver ring bands? The framed bezel is great but you don’t explain how you solder it to a band. If you want to solder a flat-backed bezel onto either a curved or flat ring shank, you need to first file a flat spot on the ring shank. Flat spot filed on ring shank. Held in GRS vise. I find it easiest to put the ring shank into a vise and CAREFULLY and EVENLY file the flat spot. It’s not as easy as it sounds. You can also drag the ring shank along a file, that is placed flat on your workbench. Once again, you need to keep the angle of the shank, consistent. You could try using a block of wood or other material to make a jig to keep the angle true. I had my husband make this for me (he is a cabinet maker so, I often force him to make tools for me. There’s usually a lot of sighing involved! The block of wood slides along a track. I either tape sandpaper to the thingy (I don’t have a name for it yet!) or lay a large file, on its flattest edge, against the wall, lean the ring against the block of wood and drag it down the file’s length. The flat spot will accommodate the flat back of the bezel. This is a sweat soldering operation. I hold the ring shank, flat side up, apply flux, warm the ring shank, apply slightly dampened solder (it sticks to the hot metal) and then heat with the torch. I use hard solder for this application as I want as much strength as possible and hard solder is strong. The strongest solder, that jewelers use, is called either: eutectic, IT or Extra-hard solder which is 80% silver and 20% zinc – compared with hard solder at 75% silver and 25% zinc. See my webpage: About Solder for more information. You can use binding wire to hold the two elements together but, as many of you know, I HATE binding wire. So, I make jigs out of either: cross-locks, pieces of ceramic, coins, and/or pieces of scrap metal. As you’ll see in the photo, I’m resting the ends of one cross-lock onto the top of another. This keeps the angle perpendicular so that the shank sits squarely on the bezel back. Heat both parts until the metal reaches solder-flow temperature. Usually, you’ll apply more heat to the ring shank as that tends to be made of heavier and larger pieces of metal. See my webpage(s) on Soldering for more information. How to solder a setting to a ring shank. You did not show how to solder the settings onto the ring shanks. Craftsy decided that the class would only be about settings. In retrospect, we probably should have shown how to solder onto the shank. I have a video using one method: filing a flat spot on a curved ring shank. It starts at about 9:30 on How to Make a Domed Ring – part two. Another method is to file a curve, that matches the ring shank, into the bottom of the setting. Also, I mention in this video that I am using a sharpie to determine the placement of the setting. I would recommend trying it with dividers too – they are more accurate. “I want to make a tension set ring or two for some citrine gems I was given. Not much info or tuts online. Tension setting requires work hardened metal so, either solder before work hardening or don’t solder at all. Buy metal that is pre-hardened (hard). The stone needs to be able to withstand the pressure – no weak stones need to apply! Diamonds, rubies, sapphires, human-made stones, etc., will work. But, if there any internal flaws, you could have problems. Work hardening will, usually, require either hammering, rolling or twisting to make it really hard so, any of these techniques could be worked into the design. You’ll need robust or very strong metal. 10 g sterling silver would be a good minimum for silver. You can also use titanium, stainless steel, plastics, low karat golds, white gold, platinum, etc. They can be thinner than sterling but, should still not allow any portion of the stone to protrude – either on the top or the bottom. Pepe Tool’s Ring Bender is a great tool for bending heavy stock, spoons or other tough to bend metals. You can use twisted wire for ring shanks too. Wind the wire, about one and 1/2 times around the mandrel – you want to create a shape that is rounded entirely – pretty much like making a jump ring. The ring shank should be smaller than you want because you need to account for the width of the stone. A ring bender comes in handy as this gauge, the metal is very, very difficult to bend (assuming you are using 10g sterling silver). Saw through the end with the most overlaps – leaving a ring band – and fit it together as you would a regular ring shank or a jump ring. Another method is to make the ring to size and then cut away material. The cut should be less than the width of the stone. You’ll have to experiment. Open the band sideways, like you would with a jump ring. Mark the ends of the wire/sheet where you want your seat for the stone then cut with a hart bur on both sides – with dividers. You should take care to line up your cuts. When the cuts are completed, close the band and slide the band up a ring mandrel, to open it just enough to pop the stone in. You can also use a screw operated ring clamp to open up the shank. If you use the screw-type clamp, you may not have to twist the metal to the side to cut the seat. Once again, I’d experiment. Use a wax stick or tweezers to hold the stone. Using a ring mandrel, with a groove cut in it, helps for this process. Grooved ring mandrel. Screw operated ring clamp. Alternately, the end of the wire or sheet metal can be forged and notches cut in it for cabochons or faceted stones, instead of cutting seats. You can also use a ball bur for round and square stones. alike. The ball bur can also be used for setting beads. This is a great idea from the masters of tension setting – Niessing – to make the cut on an angle. Tension examples. Top left is with a slot cut for the girdle and the other two are for slots cut on the ends of the shank. John Cogswell’s: Creative Stonesetting. The entirety of chapter 8 is on Tension Settings. Anastasia Young, Gemstone Settings. Information can be found on: pages 142 and 143. DIY Tools: Clamps and Vises for Stone Setting. List of Tools and Resources for Bead Setting. Question & Answers: Stones and Stone Setting. Christopher Anthony Jewelry Design: Lapidary/Gemstone Community Forum. By Bobby1, Bezel Setting A Square Cab With Sharp Corners. Last edit: April 2001. Web. Jewelry Monk by Doug, How To Bezel Set A Square Stone. July 2014. Web. Revere, Alan. JCK Online. Square Bezel Setting. JCK Magazine, January 2011 issue. Web and Print. Edwards, Michael. Ganoksin. Making Bezels With Forming Punch Set. December 02, 2010. Web. Werby, Andrew. Juxta Morph United Artworks, Using Bezel Blocks and Punches. Web. Otto Frei, How To Use Bezel Blocks. Web.